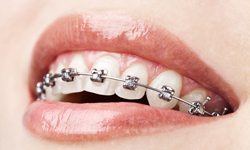 Traditional metal braces are the most common type of braces. Made of high-grade stainless steel, metal braces straighten your teeth using metal brackets and archwires that are tied in with elastic ties. Self-ligating braces are made from the same materials as traditional braces. However, self-ligating braces do not require the use of elastic ties, meaning fewer appointments and less friction being placed on the tooth. Self-ligating braces come with traditional metal or clear brackets. They are the same size as metal braces, but use a specialized clip in place of elastic ties to help the archwire guide teeth into place. The clip helps reduce the amount of pressure being placed on the tooth, and requires fewer adjustments because there are no elastics to replace. We feel it offers more comfortable tooth movement and easier cleaning. 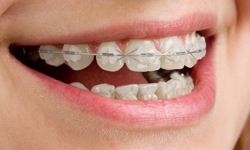 Clear braces are made of clear materials and are therefore less visible on your teeth than metal braces. 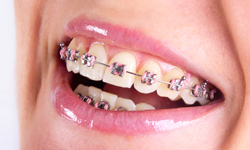 For this reason, clear braces are used mainly on older teenagers and adult patients who have cosmetic concerns. While they are visually less prominent, they do require more attention to oral hygiene as they are larger and are more brittle than their metal counterparts.